So you are craving climbing, it is to cold, rock gym to far away, well not any more. Climbstation is trying to bring climbing to every gym. What a great core workout and a way to change up your routine. recumbent bike, maybe next week, treadmill tired or running in place, Climbstation can break the winter blues, plus no climbing harness. Computer interface, moving wall. It is really a change of pace. So ISPO Brand New has released this years winners and runner-up and it is great. You have the completely portable bike that folds up and can be worn like a backpack, Nothing like walking up hill for hours only to cruise down in minutes. Other than the bike not having a seat the idea is simple and of course portable. To break it down once at the top unfold and go, no peddles just platforms for you feet, disk breaks and a front shock. O the fun you will have. Can you imagine, this is great. A close brush with a distracted driver is enough to intimidate the most avid bikers from riding at night. The problem isn’t just about visibility, as safety lights are effective at capturing the attention of a driver. However, these lights are typically constrained to the bike frame, which highlights only a fraction of the bike’s envelope. Bike lanes have proven to be an effective method of protecting cyclists on congested roads. One key is that the lane establishes a well defined boundary beyond the envelope of the bicycle, providing a greater margin of safety between the car and the cyclist. Yet, only a small fraction of streets have dedicated bike lanes, and with an installation cost of $5,000 to $50,000 per mile, we shouldn’t expect to find them everywhere anytime soon. Instead of adapting cycling to established bike lanes, the bike lane should adapt to the cyclists. This is the idea behind the LightLane. Our system projects a crisply defined virtual bike lane onto pavement, using a laser, providing the driver with a familiar boundary to avoid. With a wider margin of safety, bikers will regain their confidence to ride at night, making the bike a more viable commuting alternative. Anything that changes the way that one trains is a good thing, anyway that companies like Nike can do that is even better. Nike has invested billions in football players, shoes, equipment and has some of the best coaches working for them as well. When a individual and log on to there system pick a training plan that a Pro or College athlete might use is invaluable. Almost takes the trainer out of the equation. Within minutes you can have a training plan that will build you into some sort of animal on the plaining field, or at least the office. A series bonus is that you can download to your calendar, outlook, iCal or Google, the one thing that all programs need to start to think about is being able to read the local weather and import that into your training log, now that would up the anti. Anything that can be used outside to help you or someone is always a good thing. Now many will think that the Pocket Grappling Hook is for breaking out of prison, the uses however are greater than that. Use this for throwing a line around a branch, rescuing someone that has fallen through the ice or pulling down broken branches. The device is great can be taken apart and can be stored in the glove compartment or pack while you run. The Pocket Grappling Hook Was Originally Built By EOD Robotics, Inc. At The Request Of A Desert Warfare Operator. He Explained His Need For A Light Weight, Reusable Grappling Hook That Could Be Used To Snag Trip Wires Or Command Detonation Wires on IEDs In A Combat Environment. Soon Other Members Of The Military Saw How Useful They Were And Ordered Another Production Run. GameRunner, Something to do while on the treadmill! It is that time of year CES is running and cool gadgets are a plenty. The health and fitness market always has demo's at CES. So it's no surprise that GameRunner has developed a better way to be in the game (virtually of course), first person and able to run/walk/sprint after your opponent. This changes how one react to being in a war situation, instead of thinking you are king of the world from your couch. Running after your target is the real first person, with out getting killed, you can really see who can outlast one another, you have to rest so hiding or ducking and cover comes into play. using exercise and video gaming into one exhilerating and healthy experience for game enthusiasts, the GameRunner is a revolution in medical science and electronic entertainment. The activity of playing a video game generally leaves players physically inactive for prolonged periods of time. The GameRunner solves this problem by allowing players to use their body to play games instead of having the player sit and use only their hands. Naturally this makes playing games on the GameRunner beneficial to your heath by burning calories and keeping your heart rate up. Love the new twist, first you had a machine that was curved and allowed you to go side to side simulating skiing. 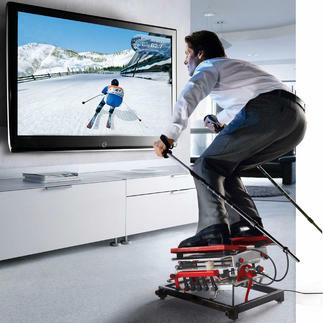 Now with SKIGYM you can actually see yourself going down the mountain. This is very similar to the CompuTrainer, you need a PC and a flat screen, the kit includes 32 race courses from 18 real-world mountain. Cost roughly $2300, might be a tough sell in today's economy but you never know, hey at least the pictures look cool. Maybe this replaces the ski vacation, at least your feet won't freeze. It can't be, the gas companies have lowered prices back to the 1980 and bike sales have dropped. Yes it is winter, so we won't know what the real market is going to look like until the spring but come on, keep biking, you never know prices could fall further. To be fair to both sides it does get silly when a tri bike cost as much as a Nissan Versa makes it hard not to buy one, or when a dealership down south is giving away a free car with the purchase of a Dodge Ram. Technology is great but lets get real getting outside for any amount of time per day is one of the best gifts that you can give yourself. So spend the extra money and get a bike that is going to last, hey bikes outlast cars by a long shot. Cheer and Happy New Year.